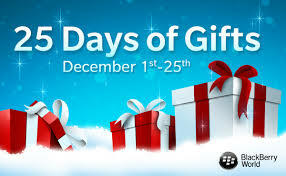 25 Days of Gifts – This year, BlackBerry is kicking off the holiday season with a new app giveaway-a-day offer for its customers. Known as the 25 Days of Gifts, each day BlackBerry will unveil a new premium paid app, game or video that will be offered to customers for free download! Running from December 1 – 25th, BlackBerry 10 users can visit BlackBerry World each day to see what new free premium app download is available that day.